how lovely! I always wondered what it looked like. thanks for sharing. Beautiful picture - beautiful quote. Great choice. So beautiful! Love the bright yellow color! I have my sons' killer smiles as entry for this week! Check it out here! Great macro! Very nicely done. This is so true! I always have to have flowers in my house. They really make a nice atmosphere! Beautiful photo! Beautiful shot of an amazing flower. Beautiful macro shot...you can't help but smile with that gorgeous yellow! Thank you for the compliments, my dears! And thanks for appreciating my choice of quote, Sukhmandir! I've heard St. John's wort is an effective herbal treatment for depression, too. Very pretty! I love the bright yellow! Great photo. 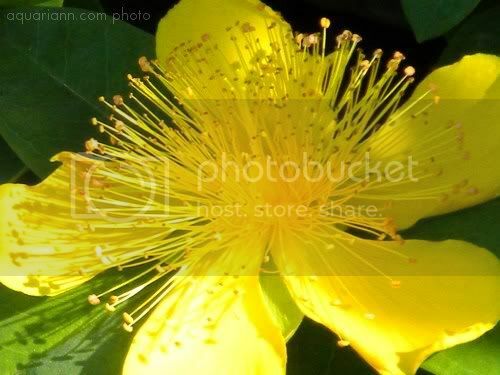 I used to grow St. John's wort and it was a mass of yellow flowers when it bloomed. So pretty! I stumbled it too! you captured this flower beautifully!! That's just beautiful and cheery! such a beautiful flower! loooove yellow flowers!